The Cambro 36CW135 Camwear® third-size food pan fits in most prep tables and food bars with its uniformly-designed 1⁄2-inch flange. Since it is made of polycarbonate, the pan is heavy duty. It is clear so staff can see the food stored inside the dish. The interior surface is smooth and non-stick, which makes it easy to remove product, reduces waste, and simplifies cleanup. 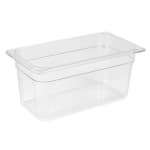 The Cambro 36CW135 Camwear third-size food pan can be stacked inside other pans without jamming. "To be honest, it is kind of hard to do food pans wrong. The industry standard is easy to follow. That being said, these pans were the cheapest..."
"To be honest, it is kind of hard to do food pans wrong. The industry standard is easy to follow. That being said, these pans were the cheapest I've seen and the quality is MUCH better than I expected. I do not run a "high intensity" kitchen, so I cannot comment about longevity or how well they handle the high heat in industrial dish washers, so please take that into account."